Access to all classes and parties and activities. On Saturday you will be able to choose to take classes or participate to the Cultural track. Access to Friday and Saturday parties with live music and a Sunday tea dance with blues karaoke. Access to Friday and Saturday parties with live music and a Sunday tea dance with blues karaoke and access to the Saturyday Cultural Track and Friday Hike. Included in the pass is: entrance to the museum, the guided tour and food for the day, boat trip back to the city on Saturday. NB: The Friday hike is open to everyone! Despite Norway's reputation as a country of independent, free-range Vikings, the last five hundred years of Norway's history hasn't actually been very free or independent. Denmark, Sweden, Germany - everybody's been pining for the fjords! So to learn more about how Norway went from an oppressed Danish colony to a proud nation of hikers, skiers, and knitted sweaters, we're taking you to the open air Folk Museum in idyllic Bygdøy. We'll start things off with a guided tour on national romanticism, and you'll have plenty of time to explore the rest of the museum on your own afterwards. Ferry: From April to September a ferry runs from Rådhusbrygge 3 by the City Hall to Dronning, Bygdøy. From there a 10 min. walk. Did you know you can walk from Oslo to Sweden? We'll be following one of the routes used during the Occupation to smuggle people out of the country - but don't worry, we won't go quite that far. We have a cozy 5 km hike planned through some of Oslo's prettiest forest, with plenty of time for socializing, and maybe even some dancing and/or swimming to warm up for the party later in the evening. The sporty types among you also have the option of taking a 5 km detour in the middle, and rejoin us for waffles at the café / cabin that marks the end of the hike. How to get there: If you're staying in the city center, take the metro 3 east (direction Mortensrud) to Skullerud T. Join the group taking the 14.31 metro from Grønland T, or meet us in front of Skullerud T between 14.50 and 15.00. From there, its only a five-minute walk to the edge of the forest. What to bring: No matter how good the weather, there's always the chance of mud, so wear waterproof, comfortable shoes. A rainjacket is usually a good idea, no matter what the weather report says, but if it's nice you can also pack a bathing suit! Don't forget to bring plenty of water, and maybe a small snack to enjoy on a sunny hilltop. 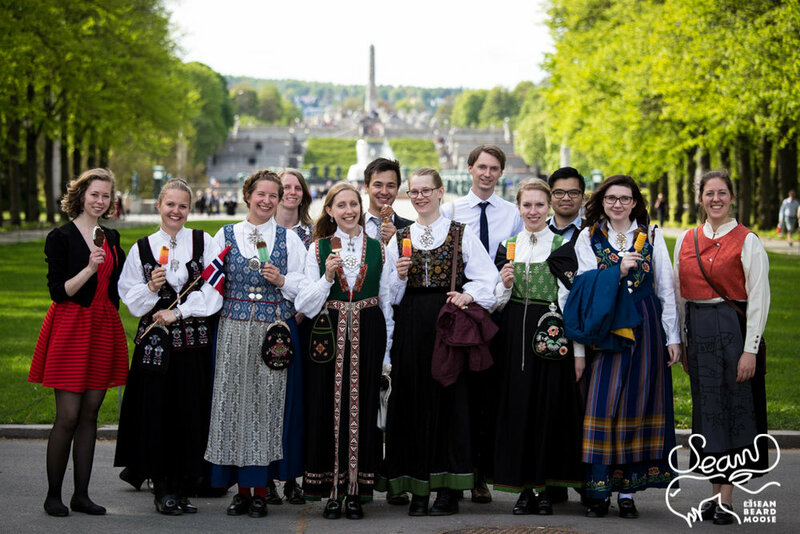 How to get there: Bus 76 or 79, or metro 3 to Skullerud T.
Thursday the 17th is Norway's National Independence Day! On this day the whole country celebrates! There is a parade of school children past the palace and many Norwegians gather and have breakfast together before going to watch the festivities. If you have the opportunity to arrive in Norway early, then this is definitely a sight to behold. Find yourself a Norwegian flag and a glass of champagne and join in the revelry. We start our weekend with a 1 hour Intro class open to beginners. Then we continue the dancing with live music and DJs. Locals David Skinner and Svein Erik Martinsen will team up to bring us fantastic live music! - until 3AM. Another awesome 1 hour Intro class open to beginners. Another awesome party with live music. The legendary Christoffer Johansen is going to charm us with his incredible voice and talent. After his sets DJs will spinn more music to make us dance - until 3AM. 'What is Blues Karaoke?' we hear you ask - well, Moose Blues 2016 and 2017 set the stage for the musical talents of our dancers to be showcased. The levels of talent were unprecedented. This time we want to open the floor to more performers. So if you sing or play an instrument, please join in. By providing words to those songs we know and love (but can't fully remember) we hope to bring more dancers out onto the stage. Dig out your favorites, warm up your vocals and experience the thrill of singing for dancers. If you need an instrument, let us know and we shall see if we can hook you up. How can you dance through to the end of the night feeling great in your body? Find the groove! We'll establish a musical groove in each song and explore it within our bodies; using 3 stages of lag to make our connection juicy! Looking to build your blues vocabulary? Taking some classic blues moves, we'll drill down into the mechanics to make them feel great in partnership, and use rotation to create smooth transitions between moves. Get ready to take your connection to the next level! The "welcoming bubble" is how we think of our shared space as social dancers. We'll work on breaking out of defaults and exploring techniques to bring more warmth, presence and connection to each dance. Mmmmm-hmmmmm squishy close embrace is what we're all about! We'll get into the details of movement within our own bodies and explore the possibilities within this wonderful connection. New Orleans: the birthplace of jazz; a melting pot of cultures and music... with Caribbean rhythms, Dixieland jazz and funky marching bands, we're cooking up a NOLA gumbo! With a base of stretch and rhythm, we're going to make our dancing extra spicy. What do Sidney Bechet, Duke Ellington and Louis Armstrong have in common? They all played the blues! As well as in Juke Joints and Honky Tonks, blues was danced in big ballrooms in the early part of the 19th century. We'll express the drama of the woodwind and horns with whooshy turns, and by getting low and getting high. This class will focus on the fundamental steps of Blues. Catherine will invite you to work on basic Blues steps and give you tools to work immediately on your quality of movement and enjoy your movements and dance from the get-go. As any other language Blues has a vocabulary, and we will explore and challenge ourselves during this 2h class. Fishtail, four corners, grinds, drag step, rock, shuffle, and more will be at the rendez-vous. This class will give you an opportunity to further work on your quality of movement and vocabulary while exploring blues style such as shuffle and latin blues and ways to keep your quality of movement while partnering.